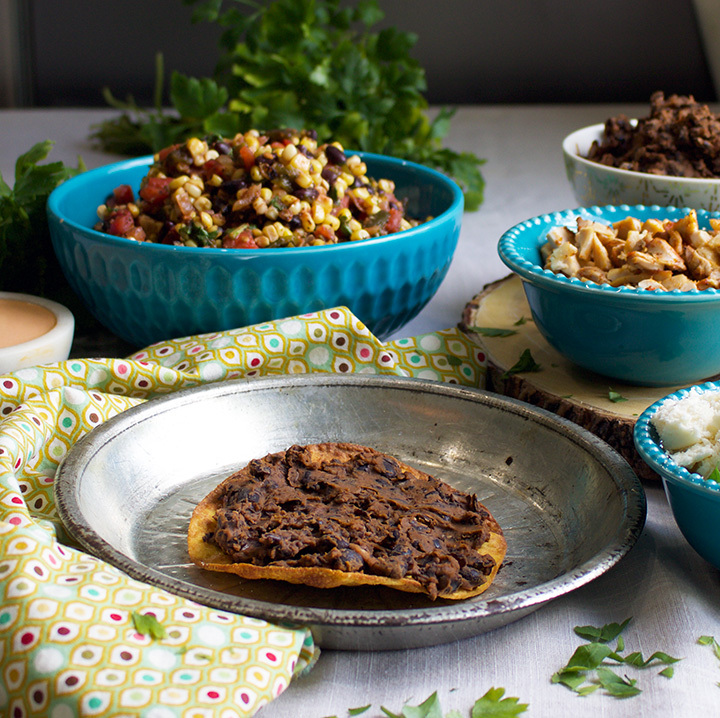 Tostadas, like tacos, are simply a vehicle for creativity, even if “creativity” means using up all those odds and ends in your refrigerator. 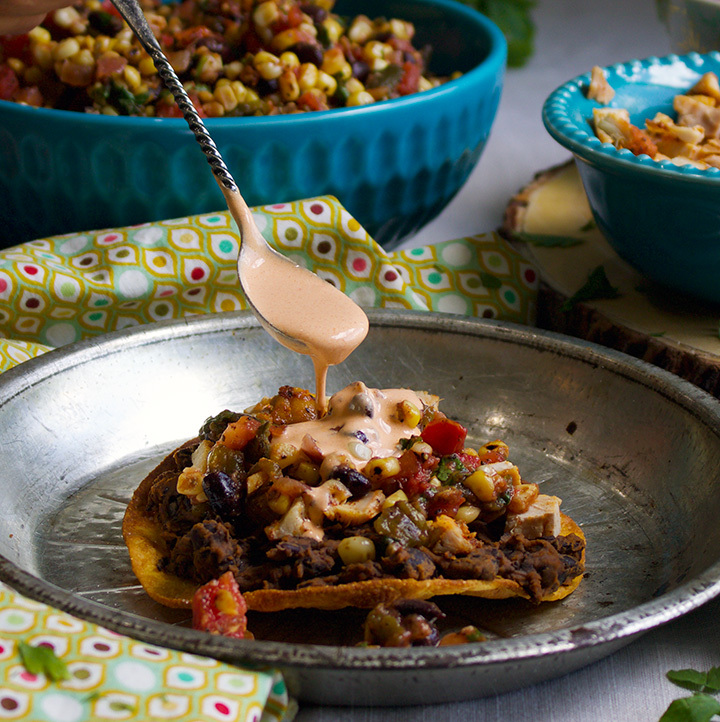 This Black Bean Tostada recipe begins, obviously, with a tostada shell covered in a layer of refried black beans, and topped with a generous amount of fresh corn salsa and a drizzle of enchilada cream. And, really, that’s all you need. Those 4 components are absolutely delicious. But, you could also chop up that bell pepper rolling around in your vegetable drawer and toss it into the salsa. Or dice up that mango that’s threatening to over ripen if it doesn’t get eaten. Whatever odds and ends you’ve got in your refrigerator, tonight’s the night to use them up. 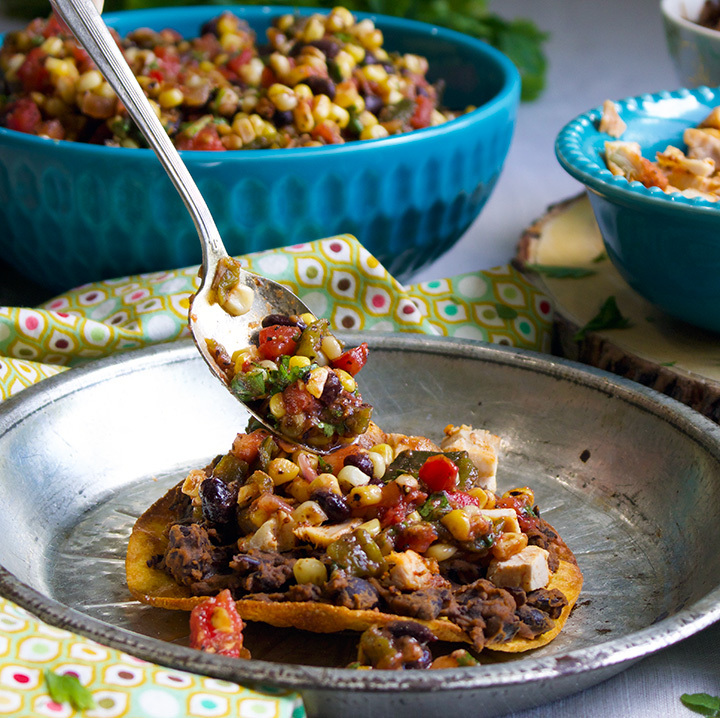 If you’re making this as a part of Summer Meal Plan #3, you might have some leftover Paprika Chicken in your refrigerator reserved just for the purpose of topping your tostada. You might also have some leftover corn relish, smashed potatoes, or bacon and tomato salad. Put it all out there and just let everyone go to town. 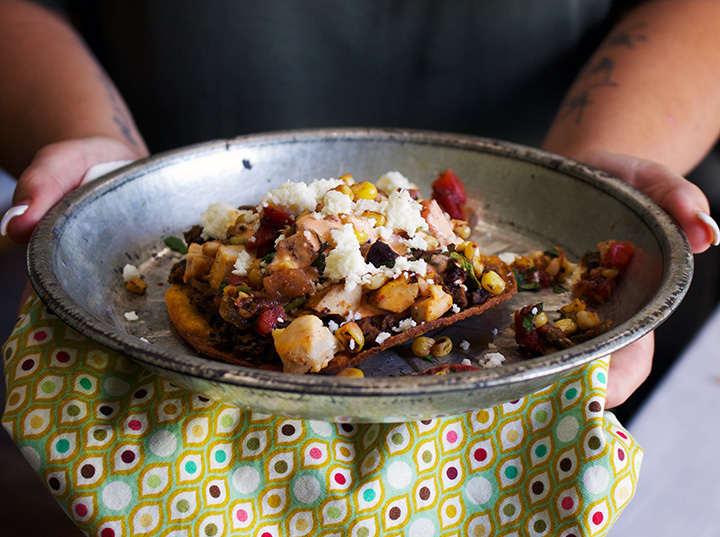 Also, a HUGE bonus if you’re one of the cooks making these tostadas as a part of Summer Meal Plan #3, is that half of tonight’s meal is already cooked, prepped and ready. In your refrigerator, you should already have a few cups of slow simmered black beans, a bowl of homemade enchilada sauce, a few cups of blackened corn, and some roasted and diced poblano peppers. Tonight’s dinner is going to be on the table in no time. 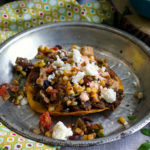 This step is optional if you are using prepared tostada shells. If frying fresh corn tortillas, add the corn oil to a deep skillet or sauce pan and heat over medium high heat until the oil reaches 350 degrees. You can test that the oil is hot enough by dropping a small piece of tortilla into the oil. If it immediately begins to simmer, with bubbles surrounding its surface, the oil is ready. Place one or two tortillas into the hot oil and let cook until golden brown on the bottom. Use tongs to flip the tortillas over in the oil and cook until brown on the other side. Use tongs to lift the tortillas from the hot oil onto a paper towel lined plate or baking sheet. Immediately sprinkle with a bit of salt. Repeat with remaining tortillas. Dump the beans into a bowl and mash with a potato masher, or just squeeze them together in your hands to mash. You want the beans to be about 50% mashed, with some completely mashed and some whole and partially whole beans. Heat the butter in a large frying pan over medium heat until melted. Add the mashed beans and cook for 3 minutes, stirring constantly, using the back of the spoon to keep mashing the beans. Add the enchilada sauce and cook for another 2-4 minutes, continuing to stir and mash. Remove from the heat and taste. Add salt and pepper if desired. Place a rack in the top third of your oven and preheat the broiler. Lay the poblano peppers on a foil-lined baking sheet and place them under the broiler. Roast until the skins of the peppers are almost completely blackened. Turn them over to blacken the other side. Remove the peppers from the oven, dump them into a bowl and cover the bowl with a kitchen towel. Let cool, then peel off the blackened skins and remove the seeds. Chop the peppers and set aside. Heat a skillet over high heat until a drop of water sizzles and evaporates almost immediately. Add the corn to the skillet and sauté until the kernels are about 50% blackened. Dump the corn out onto a plate or a bowl and let cool to room temperature. Add the diced poblano peppers, corn, onion and garlic to a large bowl and add the rest of the salsa ingredients. Toss to combine. Taste, and add more lime, salt and pepper if desired. In a medium size bowl, add the Cream Mexicana and enchilada sauce. Stir to combine. Store in a covered container in the refrigerator until ready to serve. 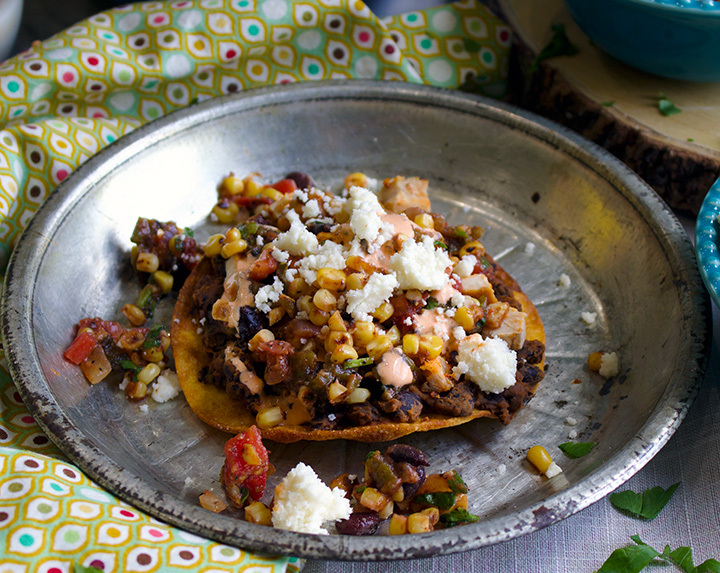 Spread a tostada shell with about 1/4 cup refried black beans. Top with about 1/2 cup (or more) corn salsa. Drizzle with some enchilada cream and sprinkle with cheese.